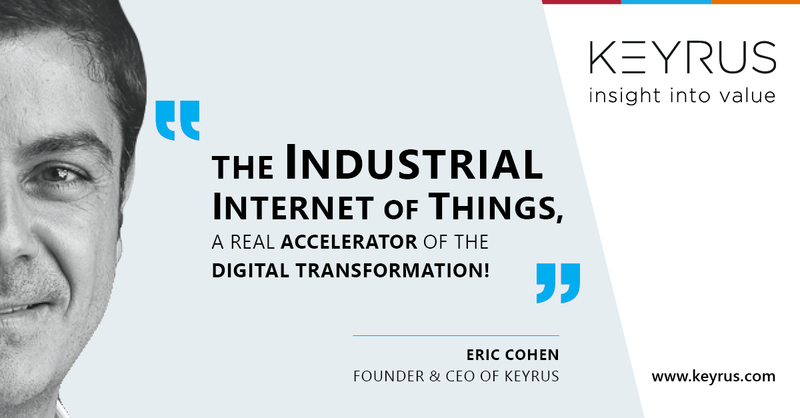 KEYRUS | The Industrial Internet of Things, a real accelerator of the Digital Transformation! It can easily make your head spin just thinking about the 20.4 billion connected objects that Gartner predicts will exist by 2020. But which objects are we talking about? The countless gadgets and everyday objects fitted with chips and sensors that we see proliferating at the Las Vegas CES and on crowdfunding sites are, of course, part of them. As are the trackers, wearables, and "self-quantification" devices which, coupled to their smartphone applications, are reinventing the individual wellbeing market and, little by little, breaking into the connected health market. All that excludes the industrial applications of the IIoT (Industrial Internet of Things), and yet, those applications cover all sectors. In fact, they are currently transforming not just production processes, but value chains themselves, by refocusing concerns on data, analytics, and the B2B and B2C services that can flow from them. The IIoT should be seen as a terrific accelerator of the digital transformation of enterprises, because it goes hand in hand with the far-reaching integration of Digital into all processes and facilities. Indeed, the sharp fall in the price of sensors and connective technologies has meant that they can now be much more widely fitted, as much into design and production chains as into the products themselves – whether it be for industrial equipment, buildings, physical networks (transport, energy and other utilities), or devices intended for the mass market. However, the myriads of connected sensors deployed in this way are not enough, in themselves, to make the new industrial architectures and infrastructures "smart". Whether they are stationary or embedded in moveable objects, these devices generate uninterrupted flows of real-time and geolocalized data. Now, making effective use of these data flows – to undertake supervision, perform preventative maintenance, achieve continuous improvements, regulate flows, etc. – necessarily involves carrying out highly automated analytical processing, in which Artificial Intelligence is set to play an increasingly significant role. The effective use of such data flows also relies on new generations of machine-to-machine applications which, fed by the analytics systems, make it possible to go much further down the path of automation. To put it another way, and one which will be excellent news for data analysts and software engineers, the IIoT-related modernization of industrial facilities is a source of millions of hours of work for the start-ups that have already taken up their positions in this field (Netatmo/Domotics, Carriots/Energy, Evrythng/Smart Products, Claroty/Cybersecurity…). The IIoT is radically changing the value chains inherited from the previous industrial age, since it is making it possible to directly link the producer up with the end user, be it a company or an individual, via connected objects embedded in products. This calls into question the role of middlemen, such as distributors, whose strength, up until now, lay in being the one who knew the end customer. For example, data generated by connected vehicles are a precious source of information on the actual technical performance of vehicles, but also on the individual practices and behavior of users. This customer insight is going to slip out of the hands of vehicle dealerships, whose position is already being undermined by the online direct sale model to which all vehicle manufacturers are turning. Data on the use of connected vehicles are used by vehicle manufacturers to design their future models, but they are also the raw material behind new services for the user: remote fleet management, tailor-made insurance, push notifications of offers – that are personalized and geolocalized – on the computers on board vehicles… Access to these data is the main reason for the partnerships that vehicle manufacturers are forming with the giants of the data economy, who also have their sights set on the markets for the connected home environment and healthcare. Today, the potential for creating new services based on the use of IIoT data is, however, restricted, in the first instance, by the absence of interoperability between connected object networks. The Industrial Internet Consortium is striving to put this right by advocating a limited number of fundamental norms for the main industrial sectors (energy/utilities, transport, healthcare, manufacturing) and the creation of standardized gateways between these norms. The second aspect acting as a check on this potential is the concern about just how secure these new, connected and interconnected industrial ecosystems are, precisely because of the increased number of possible entry points. The recent cyberattacks by the WannaCryptor and Petya ransomware served to remind us just how vulnerable they are. The third restrictive factor is the social acceptability of this widespread interlinking and the risk that it poses in terms of invasions of privacy. The resistance to the deployment of the Linky smart meter, which is key to modernizing EDF's distribution network, shows that this is certainly not the least of the obstacles to be overcome. It is only by tackling these three issues – standardization, security, and social counterbalance – head-on, that industry will be able to truly unlock the IIoT's potential for creating value, take full advantage of it, and so make a success of its digital transformation.